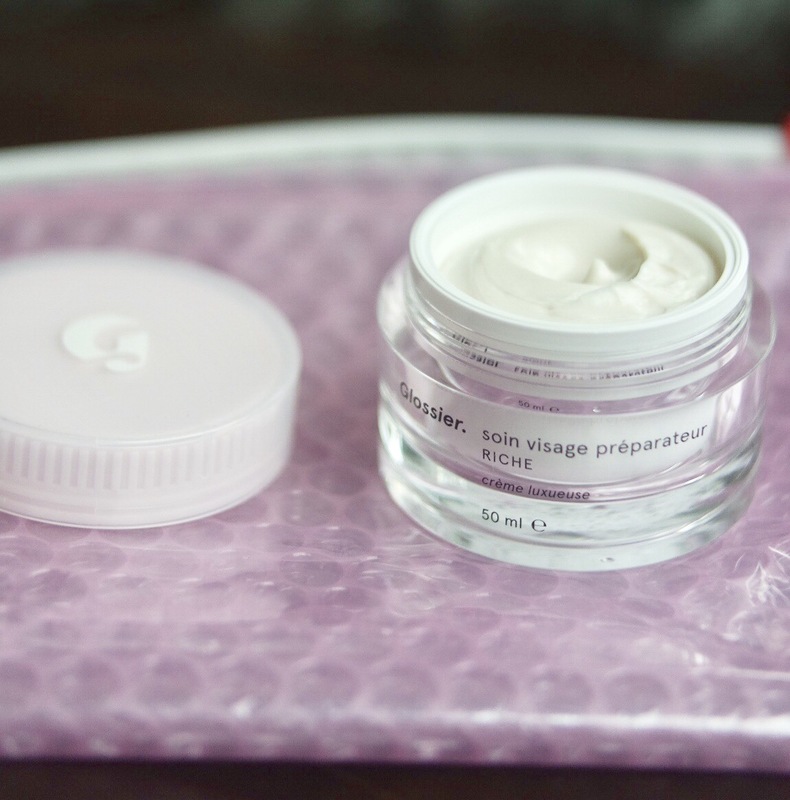 GLOSSIER PRIMING MOISTURIZER IN RICH is finally here. Rejoice! For those of us who love the oxygenating, smoothing, magic potion that is the regular priming moisturizer but need more hydration (like layer is with Super Bounce, and maybe the Moon Mask, and then mist once an hour) this product is everything you've been waiting for. It feels dense in the (adorable) package, which is actually rad because it allows you to take just the tiniest bit which is all you need. 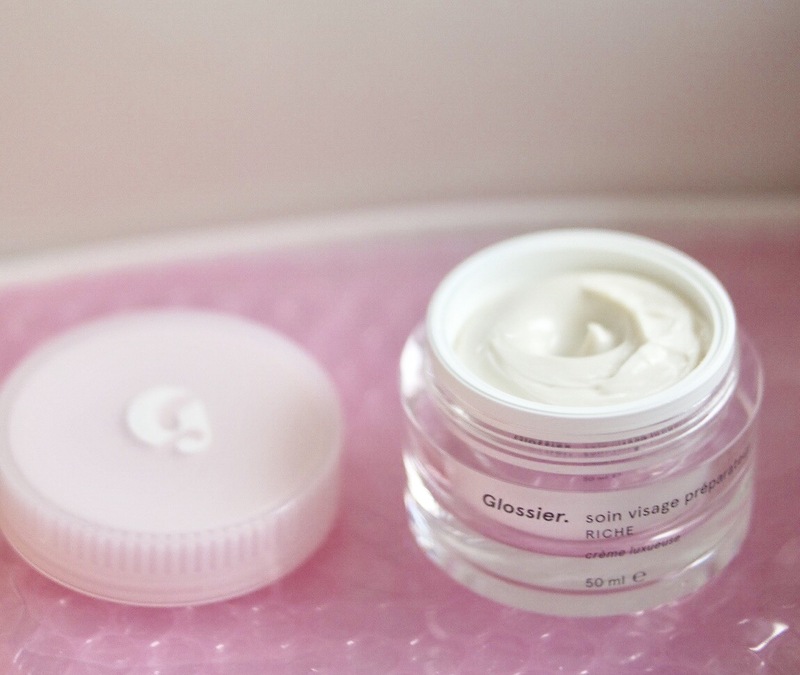 This super rich cream melts into skin, leaving behind bouncy, glowing hydrated skin without a greasy feel - and without the need for 14 other products to layer on top of it. 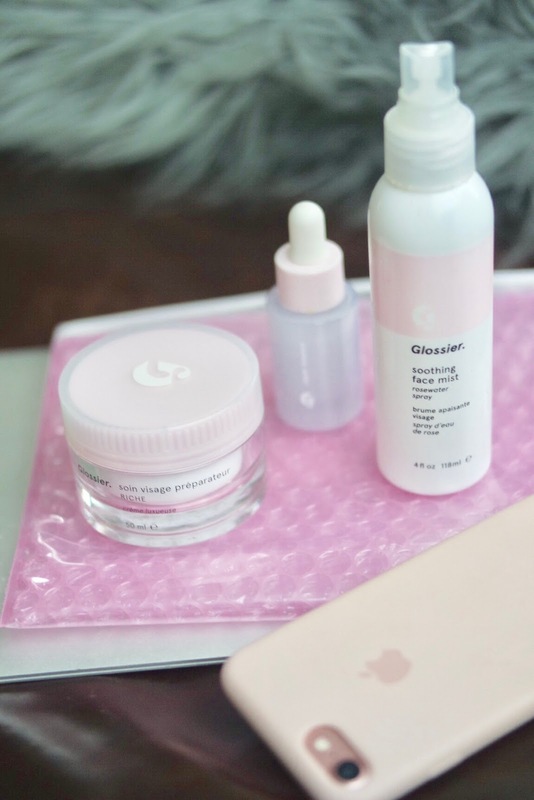 I've been using it on the top half of my face (too heavy for my chin - see my ITG article) but I noticed a decrease in tightness and an increase in radiance after the first use. After several days I noticed lasting hydration and softness, less of a need to constantly mist, and my ridiculous bounce bit decreasing dramatically. One day I even forgot to use it and I was fine. Also, I can't emphasize enough how little you need. It's remarkable, and helps ease the price tag ($35) since unlike some lotions it doesn't feel like I'm eating it for breakfast it's disappearing so quickly. My one caveat is that it does have a strong herbal smell. It's not unpleasant, but it is present. 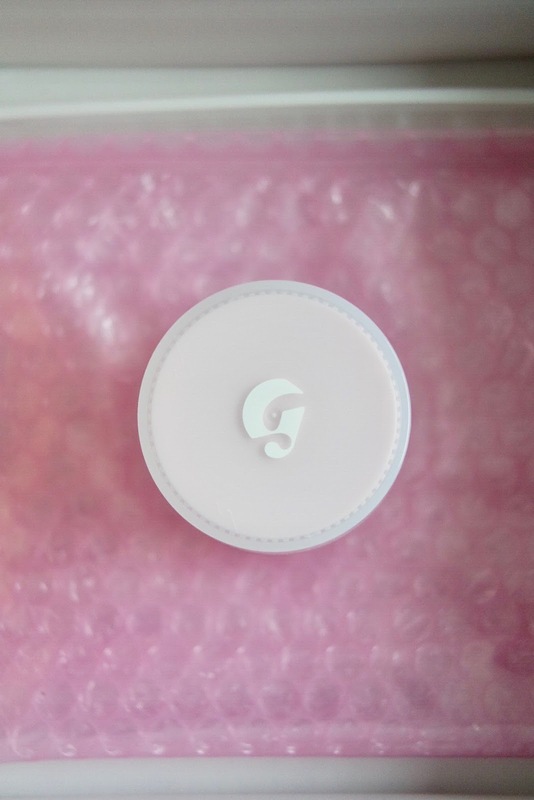 It fades quickly but it's different from the so subtle whiff of rose/no scent at all I'm used to from Glossier products. It smells like the naturally based product it is. Red Algae Complex: Sponges up water, acting as a reservoir to deliver moisture to skin hour after hour. Five Key Fatty Acids: Non-greasy Kukui Oil provides palmitic, stearic, oleic, linoleic and linolenic acids which help lock in moisture like a waterproof coating. Power Primers: Our Anti-Redness Complex calms while the Oxygenating Agent boosts stressed skin cells, improving tone and texture—even before you put on makeup. Murumuru Butter: A hard, dense, butter that we combined with shea for a decadent texture that melts into skin without any heavy feeling. I wouldn't recommend all these oils for anyone acne prone (stick with the original!) but for those of us who need more hydration (freeze dried strawberries FTW) I suggest stocking up because I am pretty sure this product is going to sell out. It's that good. 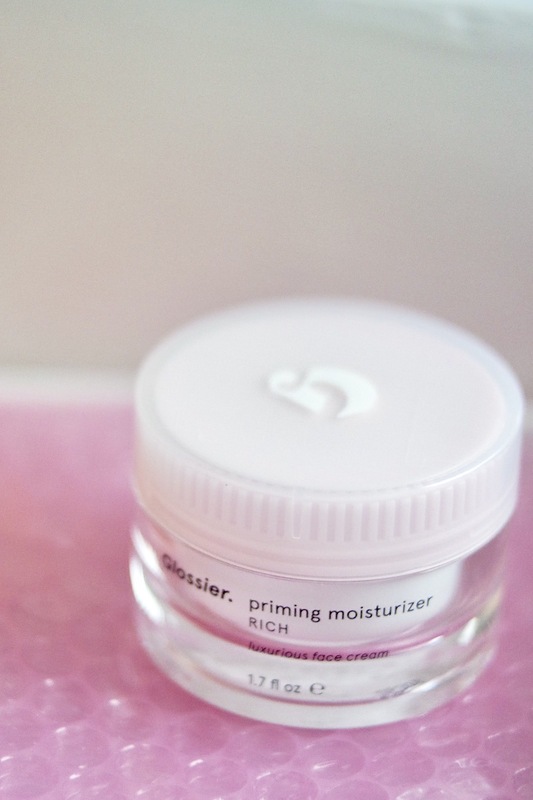 Get your own GLOSSIER PRIMING MOISTURIZER IN RICH (and use my link!) for 20% off and free shipping.